Though it was quite a wait, the third installment in the How To Train Your Dragon series proves that the five years since the last movie was worthwhile. This conclusion to the trilogy certainly outshines both of its predecessors. This particular franchise has stood out from most other animated movies from Dreamworks, being set as a fantasy drama rather than being a comedy like most of their other movies. How to Train Your Dragon: The Hidden World brings even more emotion to the table, being a compelling and tear-jerking finale for this clever franchise. A great amount of The Hidden World is focused on the relationship between Hiccup and Toothless. While these two have obviously been the star of the show since the beginning, their relationship almost always felt like a C-story at best. 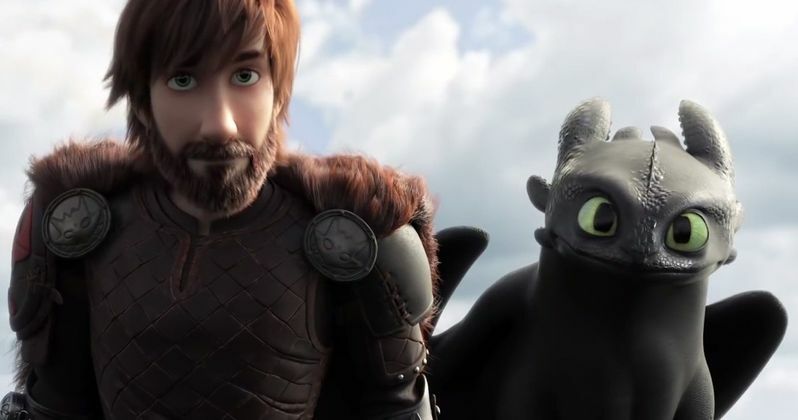 This is part of why How To Train Your Dragon 2 never felt as great as the first one - it was much more focused on Hiccup and his relationship with his parents, leaving Toothless as an adorable sidekick with very little character development. The Hidden World doesn't make this mistake. While the movie still has a villain who imposes a powerful threat, the true climax of the movie involves solely Hiccup and Toothless. Another great factor that helps The Hidden World stand out from its predecessors is its gorgeous animation. In the last couple years, animated movies have really added a lot of creativity with their contrast in colors in order to make the screen pop in a beautiful way, such as The Incredibles 2 and Spider-Man: Into the Spider-Verse. How To Train Your Dragon: The Hidden World follows suit, blowing both of the previous movies out of the water with its visuals. While it would obviously outshine the first How To Train Your Dragon, considering that the 2010 CGI of the first movie feels incredibly dated at this point, it's clear from beginning to end that The Hidden World takes a number of more creative liberties with how things look. Whereas many of the scenes in the first movie had a gray and foggy background, the third movie has spectacular settings to keep the movie visually entertaining, from a burning ship to some beautiful islands to the hidden world itself. Alas, what really makes How To Train Your Dragon: The Hidden World the best in the franchise is its ending. The resolution of The Hidden World is significantly longer than any of the previous movies. Typically, a long resolution like this one would feel tiring, but The Hidden World pulls it off very well, tying up every loose end and piece of conflict in the franchise perfectly, bringing the How To Train Your Dragon series to a sentimental and satisfying finale. There are no other franchises out there like the How To Train Your Dragon series, making watching all three movies an incredibly unique experience. The Hidden World manages to tie in perfectly with both previous movies, while still making itself stand out by expanding the universe of these lovable characters. Dreamworks have really outdone themselves this time, with The Hidden World truly validating How To Train Your Dragon as their strongest franchise to date.